Best known for The Satanic Verses and the Booker Prize-winning Midnight’s Children, Salman Rushdie charmed the audience at his sold-out Inprint reading on November 9th as he read from his new novel, Two Years Eight Months and Twenty-Eight Nights. It was a full house in the Cullen Theater at the Wortham Center, a night that was not exactly cold, but not so hot and humid. You could walk through the city all night if you wanted, but once the lights dimmed, you were happy to be waiting for Rushdie to come out, and he disarmed everyone immediately by waving at the audience. It made you feel like he was happy to be in Houston, a place he has been before, including the day before 9-11. 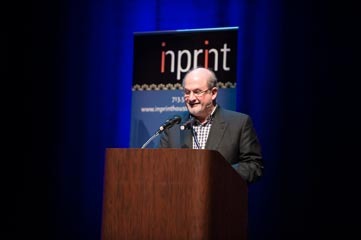 Rich Levy, executive director of Inprint reminded us of how many awards Rushdie has won—and the list is long. It is his third appearance with Inprint, and Levy explained that he was born in Mumbai before the partition of India, but when he speaks, Rushdie seems like a Londoner to me, more like Cambridge than anywhere else. Now, he lives in New York. It is amusing and inspiring when Levy reports that Rushdie started out as a copy writer for the famous advertising firm Ogilvy and Mather.